Guide shoe is a sliding part between elevator guide rail and car, what we call it guide shoe. It can fix the car on the guide rail and make car running up and down. Oil cup upper the guide shoe that can reduce the friction of the shoe line and guide rail. There are four sets of guide shoes installed in each unit, respectively on both sides of the upper beam and under the safety clamp seat at the bottom of the car; and also four sets counter weight guide shoes are mounted on the bottom and top of the beam. The guide shoes fixed on the car can move up and down along the fixed guide rail installed on the wall of the well way of the building to prevent the car from deviating or swinging in operation. When the upper and lower guide shoes are installed in the right position, they should be on the same vertical line. No slant or deflection is allowed. Both roller guide shoes and fixed guide shoes same requirement. 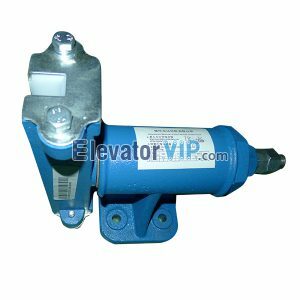 Roll guide shoes are 3 or 6 wheels stuck on the track and are generally used for elevators with a speed of more than 2 meters. Features: to roll friction instead of sliding friction can reduce the friction loss and the vibration and noise of the running, so as to improve the passengers comfortable, but this guide shoe processing and installation requirements are higher. 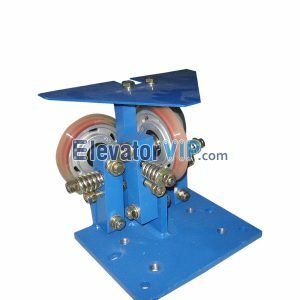 Features: died from a guide shoe head is fixed, and the structure is simple, without adjusting mechanism, as the elevator running time growth, guide shoes and guide rail fit clearance will be more and more bigger, in the operation of the capsules in shaking, can appear even shock. Elastic slide guide shoes are also divided into spring sliding guide shoes (for elevators with rated speed less than 1.7 m/s) and rubber spring sliding guide boots (for medium-high speed elevators). Posted in Technology and tagged classification of elevator guide shoe, elevator counterweight guide shoe, elevator elastic and slide guide shoe, elevator guide shoe, elevator guide shoe types, elevator oil cup, elevator rolling wheel guide shoe, elevator rubber spring sliding guide shoe, elevator spring slide guide shoe, elevator stationary guide shoe, function of elevator guide shoe, Guide Shoe of Elevator Equipment, Guide shoe types, how many sets of guide shoes are needed for elevator car, installation method of elevator guide shoe, installation position of elevator oil cup, roll guide shoes, slide guide shoes, what is type of guide shoes should be used for elevator speed 2 m/s or above, what is type of guide shoes should be used for elevator speed below 2 m/s.